Astounding mountain views, a private hot tub, and a luxurious open floor plan await you and your family and friends in this high-end . Perfect for reunions, celebrations of all sorts, and athletes competing on the local slopes, this stylish home has everything you may need for a fantastic getaway. 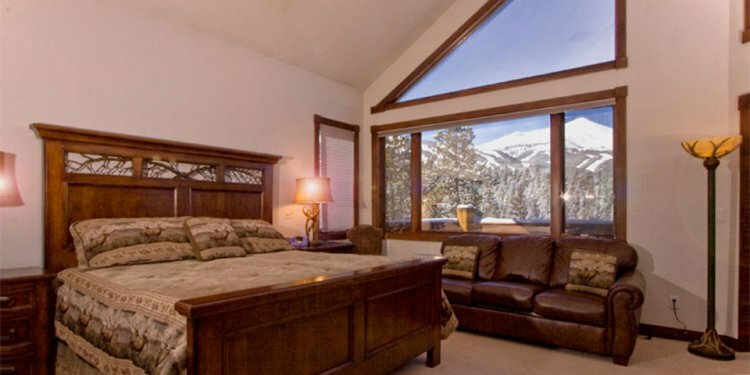 Located about three miles north of town in the highly desired Highlands area, this home is just a short drive away from the BrekConnect Gondola at Peak 7 and Breckenridge's bustling downtown area. With more than an acre of land to yourself, and tucked on a quiet street surrounded by forests, guests get to experience the quiet and activity of a mountain town all in one place. Upscale and yet comfortable beyond compare, this well-appointed home is brightly lit from well-placed windows, and is striking with its dark furnishings. Gather in the main living area on sofas and armchairs while the gas fire flickers in its stone hearth and the TV plays the latest drama or sports game via cable. WiFi is available to check email, snow reports, or Yelp listings while others read by the natural light streaming in. The kitchen is a high-tech wonderland that the group's chefs will never want to leave. Granite counters await spreads of cereals and salads, and stainless steel appliances gleam. This kitchen includes such luxuries as a double oven with a built-in refrigeration system, a five-burner stove top, a blender, a slow cooker, a mixer, and a dishwasher for easy cleaning. Guests who love wine are in for a treat: This home supplies all the necessary wine accessories including a rabbit wine opener, a decanter, a wine chiller, and wine glasses galore. Indulge in an in-home wine tasting at the breakfast bar set with bar stools. Keep the counters neat and organized by spreading out appetizers and cocktails on the dry bar near the breakfast nook set for six. Gather at the formal dining table with room for 10. Wander out to the patio overlooking the mountains while you sip drinks and barbecue, or take a soak in the hot tub by the light of the stars. Downstairs on the basement level is a den with a second fireplace and luxurious leather sofa. Watch movies and play board games, shuffleboard, or foosball to stay entertained! Up to 14 guests will sleep comfortably in this five-bedroom, four-bathroom home. Upstairs on the main floor are two bedrooms. One is the master suite with a king bed and an en suite bathroom. A double-sided fireplace keeps guests warm while one person lays in bed reading and one soaks in the jetted tub.